This Hanukkah colour celebrates Hanukkah with the bright lights of a Menorah. Bring this festive holiday to life with this Hanukkah colour-by-number. 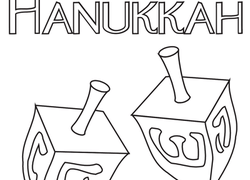 This holiday coloring page features two spinning dreidels with the message "Happy Hanukkah." This printable Hanukkah card lets you get back to the festivities without a trip to the store. Make a batch of printable Hanukkah cards for friends and family. Celebrate Hanukkah with this coloring page that can be folded into a homemade card. Celebrate Hanukkah by making these cute cutout cupcake decorations. A great weekend or after-school activity! Here's a great printable for Hanukkah this year. It just needs some colour for an artistic touch and it becomes a Hanukkah card! 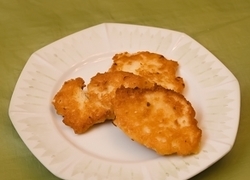 Take a break from Hanukkah festivities with a number activity! Your child will practise arranging numbers 16-20 with this cut and colour project. This Hanukkah banner will brighten up your house during the Festival of Lights. 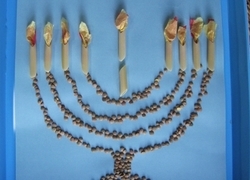 Make a Hanukkah banner with your child this winter. This menorah coloring page is a great exercise for your kid during Hanukkah. 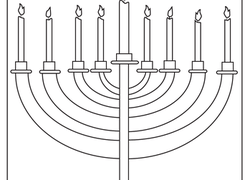 Try our menorah coloring page for a simple way to celebrate the Festival of Lights. This Happy Hanukkah card helps your child wish someone well during the holiday. colour, fold, and sign this Happy Hanukkah card with your child this winter. This holiday season, cozy up with your child, some hot cocoa, and this Jewish version of the game tic-tac-toe for some wintery fun. Your kindergartener will be delighted to create a kid-friendly and festive Menorah that she will have the honor of "lighting"! 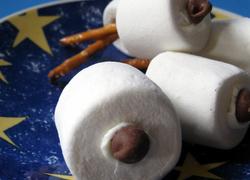 Make these edible dreidels out of marshmallows, pretzels and chocolate chips for Hanukkah. Non-slip socks are the perfect DIY gift that your kid can make for friends and family. 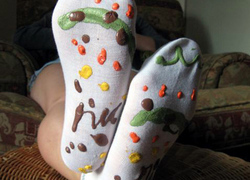 Make a pair of non-slip socks with your kid for wholesome family fun. 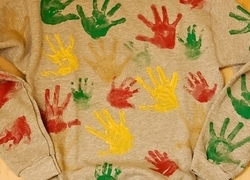 Your kindergartener will delight in creating this "handcrafted" sweatshirt for Grandma and Grandpa this holiday season, filled with her colorful handprints. 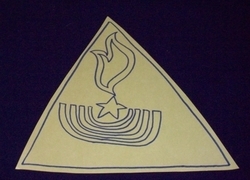 Your kindergartener will be delighted to refine his motor and conceptual skills as he creates his own Maccabee shield in honor of the Maccabee revolt.